The pillars of triathlon performance are endurance training (naturally), nutrition, recovery and strength and conditioning. Elite coach Matt Dixon explains why everything other than swimming, biking, and running should NOT be an afterthought, but rather, an equally important part of the athlete's program. How Matt burnt the candle at both ends in his own athletic career, and learned invaluable lessons that have shaped his coaching philosophy. The pillars of performance in triathlon: endurance training, nutrition, recovery, and strength and conditioning. How Matt lays out the training in his programs over the course of a season. Looking back, I think I am a prime example of how to do a professional career poorly. "With the help of crazy coaches and potentially poor coaching, I managed to train myself into the ground as a professional athlete.​"
How did you get yourself into that hole? Was it too much training overall? Ot too much intensity? Our training program was high volume, about 25 to 27 hours of swimming every week. Almost every day felt like threshold. The in-season times that I was producing were very similar to the times when I come to the big events of the year like national championships and things like that. It was a combination of high volume, high percentage of training, and moderately hard to very hard effort. In triathlon, where I really ran into the biggest roadblocks, I essentially took that work ethic and applied it to Ironman training. I am a big guy. At the moment I am about 195 lbs, but when I was racing I was maybe 185 lbs so I was a much bigger athlete. Taking that work ethic and having coaches who would take that work ethic as well, it was high volume and too much intensity. Of course, I could never really hit high intensity because I did too much moderately hard intensity on this big volume . The other part that was really important was the supporting cast, like very poor fueling habits and being told to drop weight and get lighter. Of course, this starts to move into negative eating patterns and really try to almost limit my calorie intake, probably not following the appropriate fueling following workouts. I think there was an athletic starvation going on. I did not have a massive emotional connection with food but the athletic starvation started to compromise that and a simple lack of recuperation, a lack of quality and sleep. "When I look back at it now, all of the red flags were there like night sweats, broken sleep, overall fatigue, loss of motivation, but physiology ultimately collapsed before my work ethic gave out. I was a victim of my own habits in many ways." What are the Pillars of Performance and how can it be applied in our training and lives? In support of this swimming, cycling and running, for an athlete to be successful, there has to be emphasis, intent and focus on recovery as a component of it, and that is a broad subject in itself. Strength and conditioning is particularly important for amateur athletes although every one of my professional athletes incorporates strength and conditioning. Then there is the big bucket of nutrition which includes fueling during and immediately following the workouts, hydration during and outside of workouts, and a daily platform of eating. I developed this most as an educational tool. I want athletes to take a step back and not become so obsessed with training success, global program success, being focused primarily on swim, bike and run and then have the others being an afterthought. Instead, what we did is create the Pillars of Performance and said this is the program. So when you are a Purplepatch athlete, your program is not swim, bike and run and everything else is an afterthought. To be successful, you need to have integrated recovery as part of the program. It is not an afterthought, not a place that is there just to sit back and look at as something fearful for an athlete. It is a part of your program in the same way as good eating habits, sleeping habits and everything else become a part of it. By changing this relationship, what I was able to do was to get athletes to adhere and see the big picture. What does this look like in practice? Do you actually have, say things like nutrition and sleep programmed into the athlete’s training schedule as reminders? Or is it more like education during coaching calls? It think it is a little bit of both. You mentioned education at the end there and the first almost answered your question at the start which is what is coaching? What is our role and job as coaches? What are we to do? Unfortunately, I think a lot of coaches think that prescribing a training program on an Excel spreadsheet or in Training Peaks or other planned delivery is coaching. For me, I feel like we are teachers. Ultimately, what I am looking for is for the athlete to become empowered with the ability to make smart decisions, to understand what the intent of the workout is and to go be able to prescribe it. The Pillars of Performance are absolutely integrated into the training program. I build it with a hierarchy of importance in sessions. There are the sessions of the week that are providing the greatest specificity that are central to the week, the do not miss sessions, that we want athletes to be ready for. Then we have the supporting sessions which are those sessions that are there to facilitate recovery, prepare for the upcoming key sessions or provide overall endurance. Even within those sessions, we have scalability that is based on either time or fatigue status. Can you give a few main take aways on nutrition, recovery and functional strength training? For training it is very important for athletes to have seasonal breaks, but I prefer to drip feed frequent recovery rather than thinking three weeks of hard work and one week of complete recovery. I think that diminishes much of the quality of the three week of hard training that you are doing and waste time by doing a complete week of recuperation. I like to inject two to three days of lighter training every 10 to 14 days or so. These are lighter recuperant sessions that have real purpose or intent. The number one recovery tool that you have, and it is free, is sleep. Use the power of naps, 15 to 30 minute naps or meditation, you don’t have to fall asleep to be effective. In the nutrition bucket, the most important recovery tool along with sleep is post workout fueling. This is non-negotiable for a purple patch athlete. Nutrition is something you can control. The final component which is strength and conditioning is a big subject by itself but it has to be progressive, specific to the sport and it has to be year round. Further away from racing, it can be a bigger component of the weekly training schedule. As we go through race season and into races, you probably might want to do one session a week. What should be the mind set of age-group triathletes? "To use a professional athlete as our barometer of success is a failing mission.​"
If an athlete wants to be successful, he has to approach it from the other side of the equation. Take a really good look at themselves and their lives and look at which things are unmovable like their health, relationships, jobs, travel and other things then optimize your triathlon training around the hours that you have. It should not feel like you are shackled or sleep deprived because of your triathlon training. To even further help bust that myth that age groupers have to train as many hours as the pros to achieve success at an amateur level, can you give some examples of age groupers having success on limited training volume? We have many. One of them is Sam﻿i﻿ Inkinen who is a tech entrepreneur. He is a very strong guy with lungs like an elephant. When we started to work together, he was just starting Trulia. So we came up with a goal of training for 10 hours a week and my challenge as a coach was to guide Sami on what is the best use for those 10 hours. We periodically enable him to do some big rides on the weekend back to back to get some of the Ironman specific training. Very occasionally, once every 6 or 7 weeks we would get him to do a big block of two days. Over the course of that time, he became amateur world champion and broke 9 hours in Hawaii. We actually like every Purplepatch athlete to hit every intensity every week. The mission is where's the focus and the emphasis, where is the mission of the training program. We create training programs that are pragmatic and relative to the realities of life. Fifty to sixty percent of the year is race specific training. The key sessions of the year are almost dress rehearsal like. We don’t want athletes to have a great year, we want them to have a great career. What can athletes expect from you when they sign up for Purplepatch? We have a lot of coaches and athletes who participate in our education membership where they can ask questions and have full access to our library for only $25 per month. If an athlete wants coaching and support, there is a range and they may also work with me. They may check out purplepatch.com for more info. We have a broad range of tiers and levels that they can choose from. What’s a personal habit that has helped you achieve success? Prioritize sleep and napping. Eliminating alcohol and beer in the evening. What do you wish you had known or done differently at some earlier point in your career? As an athlete I did almost everything wrong. The one thing I did right was learn as much as I could, have a conviction and courage to do what I believe. 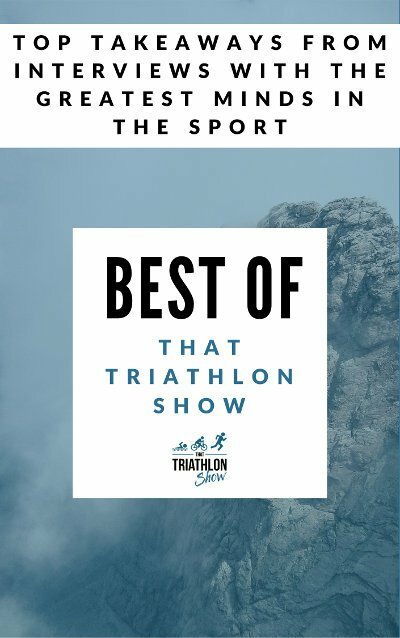 Tips on swimming, biking, running, and general training from expert coaches like Joe Friel, Jim Vance, Gerry Rodrigues and pro triathletes like Ben Kanute. The things you didn't know (but probably should) about nutrition, strength training, sports psychology, and recovery with Matt Dixon, Kim Schwabenbauer, Samuele Marcora and others. Learn all about the habits of the greatest in the sport, their favorite tools and triathlon equipment, and their top resources related to triathlon.